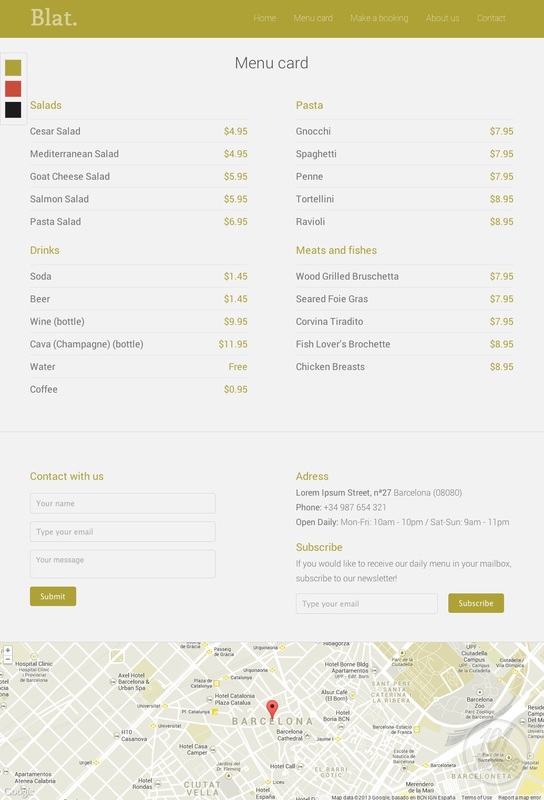 If you are looking for a pretty, responsive restaurant HTML5 template, you should check out Blat by Mild Themes. This template is featured on Mojo Themes and it has a nice deal of features and options. Blat is a landing page template for restaurants, and it is extremely easy to setup and customize. You can choose out of 3 different color schemes and decide whether you want to have an image slider or a clean and flat design. Your own customized color scheme can easily be created as well. It is very easy to configure and customize and you can edit and personalize the basic info for your webpage in only one file. You can customize just about anything, including style, logos, forms configuration, Google Maps coordinates and style, MailChimp integration, etc. With a single page layout included, you can have all your content displayed with great style without anything looking messy. A lovely menu card is included and you can add photos and prices for each one of your meals so your visitors know exactly what they are in for. 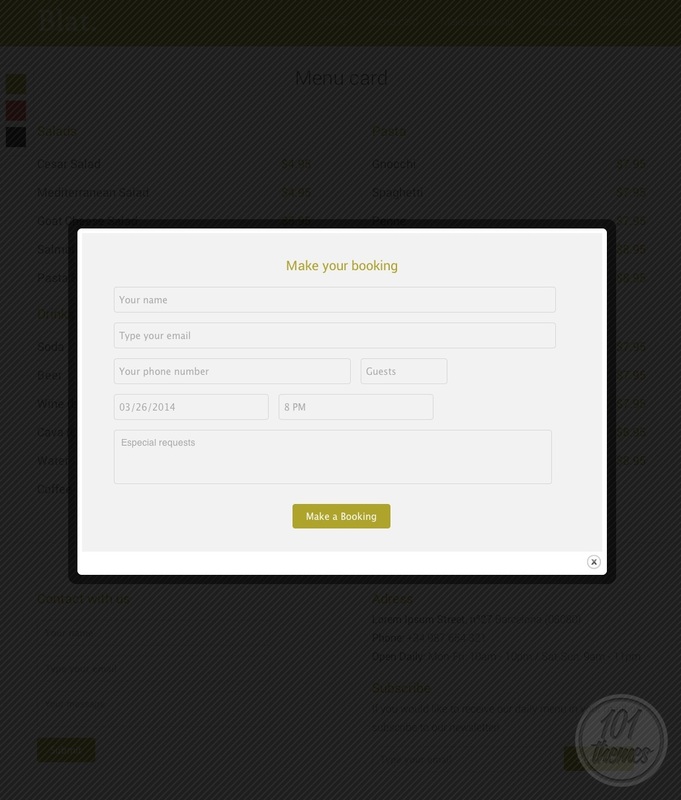 A great reservation form is included, allowing your customers to book a table at your place right there on your website. A nice “about” page will allow you to introduce your restaurant to your guests properly and tell them a little more about the history of your place. Events are featured, making it very easy and quick for you to display any upcoming happening you have organized for your guests, and you can also display nice testimonials from your satisfied customers and let them enhance your website. As mentioned before, Google Maps is included and you will have a map with your restaurant pinned to it displayed on your website so everyone can easily find it. A nice contact form is featured, and you can have your visitors subscribe to your emails. 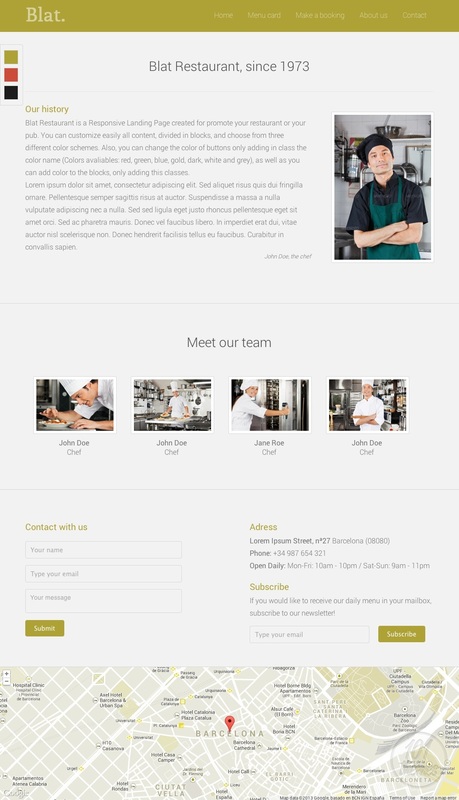 Being a responsive HTML5 restaurant theme, it guarantees your website is going to look great on all devices.